One of the most iconic coastal features of the North Island of New Zealand, Reflecting on Piha depicts Lion Rock, framed by the surrounding lush flora. Lion Rock splits the beach into North and South Piha and is also known as Te Piha, which refers to the pattern of waves being separated by and breaking over the front of the rock, as on the prow of a canoe.This is a view of the rock as it is rarely seen. 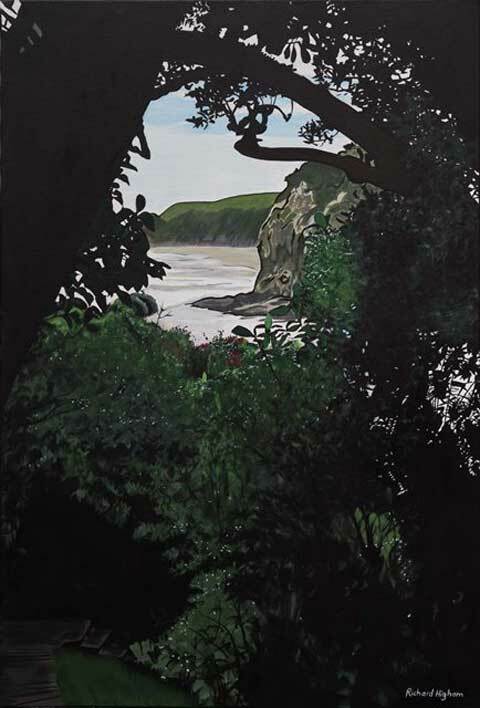 “The pathway just seen leads up past low lying undergrowth like a tunnel, and as you come out you look back through a canopy of Pohutukawa trees which frame the rock with a silhouette of filigree.” The beach is windy and rugged and one of the favourite day-trip spots for the artist. Acrylic on canvas, 2015.